The dates for the APS 2014 conference have now been finalized. The meeting will take place at the Melbourne Planetarium at Scienceworks on the 17th & 18th of February. Following on from the APS meeting in Brisbane earlier this year, the conference will be taking place on a Monday and a Tuesday. Hopefully this will allow those travelling from interstate or overseas the chance to arrive a few days early and enjoy the weekend in Melbourne. This year we have also planned a pre-conference tour of the Great Melbourne Telescope which is currently being restored at Museum Victoria. This tour will take place on Sunday the 16th of February from 2pm-4pm. 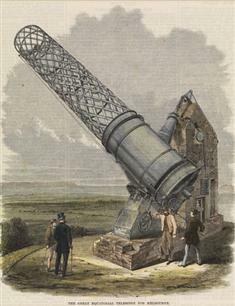 Our guide for the tour will be Dr. Richard Gillespie author of The Great Melbourne Telescope. Please make sure that you mark these dates in your calendar, as we are planning a jam packed conference. And keep watching the blog for further announcements, details of the meeting and a few other surprises. This entry was posted in Uncategorized and tagged APS conference, Melbourne. Bookmark the permalink.